As the market innovates, Data and analytics vendors are upgrading traditional solutions to expand their product portfolios and services by offering competitive products and solutions. 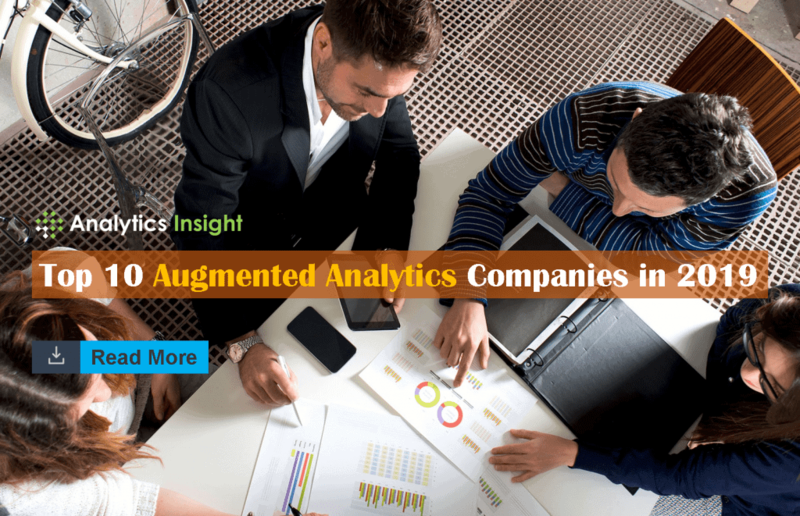 Here are the Augmented Analytics companies that make on the top 10 list in 2019. Microsoft Power BI offers a host of services that incorporates interactive dashboards, data preparation, data discovery, and augmented analytics from a single product. Power BI Report Server allows users to share reports but lacks some of the machine-learning capabilities found in Power BI SaaS. Microsoft Power BI Desktop can be deployed as a stand-alone, free personal analysis tool to ease the authorization of complex data mash-ups which involve on-premises data sources. Qlik offers a host of services which include agile analytics, BI solutions and governed data discovery via its lead product Qlik Sense. The Qlik Analytics Platform enables developers to create customized applications useful for embedded use cases. QlikView continues to be enhanced to make up a larger portion of the company’s installed customer base, while Qlik Sense now accounts for more than 50% of license revenue. QlikView’s in-memory engine gives its customers the power to build interactive and robust visual applications. Qlik NPrinting is an optional server component from the enterprise that supports Mode 1 BI with report distribution and scheduling facilities. Tableau empowers its users with drag and drop analytics without the need to know how to code to present their findings on an interactive dashboard. Tableau offers three primary products that are Tableau Desktop, Tableau Server and Tableau Online (on the cloud). Tableau has always been committed to its users giving the power to explore and find insights in data. Tableau with its niche offerings has disrupted the market causing the competitors to stand up and take notice. As part of a shift in strategy toward large enterprise deployments and sales, Tableau has delivered on a number of promised enterprise features that appeal to an IT buyer. It has recently released certified and recommended data sources for improved governance of large deployments; scheduling and alerting; an enhanced SDK and APIs; hybrid data support from the cloud; and added collaboration among others. IBM is represented on this list with two products this year which include IBM Cognos Analytics and IBM Watson Analytics. Cognos Analytics version 11 and higher represents the rebranding of the Cognos Business Intelligence product (version 10.2.2 and earlier), to signify the integration of production reporting capabilities with self-service dashboards and ad hoc analysis within one modern analytics and BI platform Cognos Analytics is available both on-premises or as a hosted solution on the IBM cloud. Watson Analytics also provides augmented analytics capabilities, which includes support for NLQ generation, embedded advanced analytics via a cloud-only solution and automated pattern detection. Salesforce rebranded its analytics portfolio from Einstein Analytics to Salesforce Analytics in November 2017 and the platform includes basic operational reports and dashboards for Salesforce data, Einstein Analytics-based packaged applications, Einstein Discovery and the Einstein Analytics Platform (formerly Wave). The Einstein Analytics Platform is for creating dashboards, point-and-click interactive visualizations, and analysis with integrated self-service data preparation for Salesforce and non-Salesforce data. The Einstein Discovery is an augmented analytics platform leveraging machine learning to generate smart suggestions for data preparation, to automatically find visualization to document important insights in a story for every user, without requiring them to build models or write algorithms. SAP delivers a broad range of analytics and BI capabilities which are useful for both large IT-managed enterprises and business-user-driven modern deployments. The SAP offerings that are on the list include SAP Lumira (a module within Business Objects Enterprise) and the SAP Analytics Cloud solution. SAP Analytics Cloud’s machine learning technology augments the analytics process, helping users go from insight to action in a fraction of the time. Automated technology enables them to avoid agenda-driven and biased decision making by revealing the story of what drives the business. SAS competes in the analytics and BI market with additional imprints in the data science and machine learning market. SAS Visual Analytics is the primary product offering that brings interactive discovery and dashboards in addition to reporting and scheduling for mainstream business users. The advanced analytics capabilities within SAS Visual Analytics are geared toward citizen data scientists, who don’t need to be experts in the coding of specialist statistical skills. SAS Visual Analytics is available either in an on-premises deployment or through the cloud in SAS’s own data centers or from third parties vendors such as AWS. TIBCO Spotfire was an early visual-based data discovery disruptor that transformed the market from traditional reporting to modern BI and analytics. Spotfire offers extensive capabilities for analytics dashboards which include interactive visualization and data preparation in a single design tool and workflow while offering flexible processing options either in-memory or in-database integration. To keep up with the market trends, TIBCO has continued to expand its feature set to include streaming analytics, location intelligence, data science, machine learning, data cataloging and, most recently, data virtualization through OEM relationships, integration with TIBCO middleware and acquisition. During the last year, TIBCO has continued to invest in marketing, land-and-expand initiatives and sales in order to generate renewed market awareness for an expansion in its installed base. Sisense offers an integrated analytics and BI platform encapsulating the entire workflow from data collection to storage developed on a self-contained in-memory columnar database. These facilities are supported with visual data exploration, in-chip processing, dashboards and recently added embedded advanced analytics features. OEM and embedded analytics continue to be the core area accounting for more than half of the company’s revenue. MicroStrategy Version 10 combines self-service data preparation & exploration with native big data connectivity over enterprise analytics and BI. MicroStrategy offers a fully interactive visual exploration experience integrating the best-in-class enterprise reporting and mobile capabilities delivered in a single, integrated platform and workflow. All these positives make it better-suited to governed data discovery deployments and large-scale SOR reporting for large and complex datasets than most other offerings.